The primary audience is newcomers to the United States, recent and not-so-recent immigrants, who may be studying at an American high school, adult school, community college, or university. Focused on the needs and aspirations of intermediate English language learners, the text shows a variety of ways to create and sustain authentic conversations with a developing English vocabulary. Compelling American Conversations challenges intermediate English language learners to reflect and speak about their lives and experiences on 15 topics in class and in English. Knowing English should include the ability to speak English. Search and share online activities where students select materials on specific topics, summarize and evaluate the video/article, and introduce to small groups of classmates. We also include academic vocabulary and more philosophical questions because American immigrants deserve the same level of sophisticated materials which international English as Foreign Language (EFL) students enjoy in the stronger international high schools. 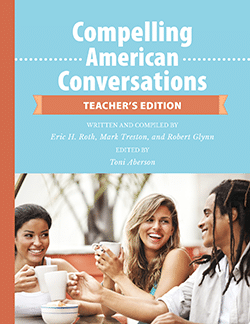 Buy Compelling American Conversations Teacher's Edition! Discounted single copies of Compelling American Conversations for Intermediate English Language Learners are available directly from Chimayo Press with Paypal. Please contact us directly to discuss an order. Call 1-855-ESL-Book (1-855-375-2665) and 310-390-0131 outside the U.S. and Canada, or Email laurie@compellingconversations.com. We offer free shipping to schools, college bookstores, libraries, churches, and other non-profit organizations in the United States on orders of 20 books or more when order through us. Naturally, you will receive the same discount - plus free shipping - when you directly call or email us for your bulk orders. Read our Press Release about this book!